As The Australian reported, last year Abdel-Magied took a taxpayer-funded jaunt across the Middle East. The #YasMENAtour, as it was called (her words), took her to Saudi Arabia, Qatar, Sudan, and other countries with atrocious records in women’s rights and legal systems that just happen to mention Sharia and its virtues. Unfortunately for Abdel-Magied, none of this led her to an outbreak of coherent thought. On the Q&A program, she spoke highly of Sharia and wouldn’t stand to be told about its faults. In her reading, it’s all about justice and equality, a few optional prayers, and spiritual merry-making. That sounds swell, and who could disagree with it? Well, probably a vast majority of the world’s Muslims, for starters, as well as more than a few Islamic scholars. There may be perfectly benign elements to Sharia, but it also undoubtedly has something to do with the motivations of the Islamic State, the brutal punishments reserved for apostates and homosexuals, and the immiseration of Muslim women. This much needs to be acknowledged. Abdel-Magied, however, endeavours to be a person on whom everything is lost. She argues, and is virtually alone in doing so, that any negative aspects of Sharia are attributable to Western colonialism, rather than the sacred texts of Islam. She seems to believe that religion and culture are separate and do not overlap. In this way, culture can be charged with crimes and misdemeanours, but faith is always exempt. This is a senseless claim, but it manages to immunise the religion of peace against critical scrutiny. For her, Islam is all Sweetness and Light and anyone saying otherwise ought to be yelled at. Or, to paraphrase Abdel-Magied herself, she just doing her thang and the peeps be like dissin’ her religion. Ease up on the secularism, he advised (and all that inshallah-ing is a good start, I would say). She had “ended up framing Islam through a secular lens, aimed at a secular people and conscious of the presence of a secular government.” Like all good Islamists, Doureihi dislikes the non-theocratic stuff. Is it really, Yas? Really? I would think it fairly easy to avoid a consultation with Hizb ut-Tahrir. Its members are rather fond of Sharia, it’s worth noting, and this seems to inform the virulence of their views on women, gays, infidels and so on. They tend not to hide their views, either. Doureihi, after all, is best known for an interview on ABC when he refused to condemn the jihadists of the Islamic State. This pathetic excuse for an answer replaces outrage with pity. Now, I don’t mean to suggest that Abdel-Magied is a closet Islamist or anything like that. But I do mean to say that the left-wing media has made a huge mistake by constantly elevating her and then treating her with uncritical reverence. She adds so little of substance to serious debate over Islam because her real talent is for narcissistic windbaggery. After all, at the ripe age of twenty-four she decided that it was about time she got around to writing her memoirs. The point that I’m trying to make, is that for you, you definitely ONLY believe in one way of a government. ONLY believe in, umm secularism . . . there is no room for theocracy – that is what you said, no room for “Islamism”, that is correct. So what I’m trying to say is that there doesn’t need to be that limitation. Such are the views of the Muslim ‘moderates’. Saleh has paid no reputational cost for her musings on theocracy. Nor have her impeccably left-wing credentials ever been up for reassessment. Meanwhile Nawaz is largely friendless in the Muslim community, reviled by the Left, and branded an anti-Muslim extremist by the cretins of the Southern Poverty Law Center. Ayaan Hirsi Ali is on that list, too, and it’s sometimes hard to determine who hates her more, the Islamists or the left. Usefully, perhaps, they have recently combined in the person of Linda Sarsour, the activist and hero to ‘liberals’ everywhere. The Muslim reform movement is doomed so long as figures like Abdel-Magied, Saleh, Sarsour and their co-thinkers dominate the conversation and regressive leftists nod dumbly at their every utterance. It’s hard to be at all optimistic about change, however. That’s why I qualified my earlier insult: Abdel-Magied’s assertion of Islam’s feminist credentials is only the most risible thing she has said thus far. It’s safe to expect a whole lot more. Timothy Cootes writes for Quillette, The Spectator Australia, and Quadrant. Follow him on Twitter @timothycootes. Co-thinkers? Co-babblers, you must mean. What a ridiculous, senseless prattle. Whilst I don’t disagree with anything the writer said, I don’t think that Quillette deserves to be cluttered up with articles like that, because the world seems to be full of people like that who are either just ignorant, hypercritical, or self delusional as, I believe it was Sam Harris, put it. They are better just ignored. Brilliant article, but sadly still falling on very deaf ears. How people can call themselves lefties but not be fighting tooth and nail for the human rights of women in all those violently oppressive theocracies beggars belief. How a Muslim can call themselves moderate and not condemn the atrocities whole heartedly and outspokenly also beggars belief. But so it is and so it goes. Well done for this excellent article. NOW, I remember! I was trying to think, why her name sounds so familiar…she was the one who started the entire stunt of walking out of Shriver’s lecture. If she didn’t have the platform a free society offers, she would shrivel and die. Her ego has her by the neck. When that happens, all rational thought goes out the window. I agree with another commenter that this piece is ad hominem- what I’m really interested in finding is a piece that takes apart her claim that Sharia itself is benign and cooperative but only become misogynistic/toxic in certain places. Diana, the purpose of this piece is not about “taking apart her claims about Sharia [being benign]…” If you you really want material on that topic, you only need start with Wikipedia, then work through the citation sources for confirmation and more detail. 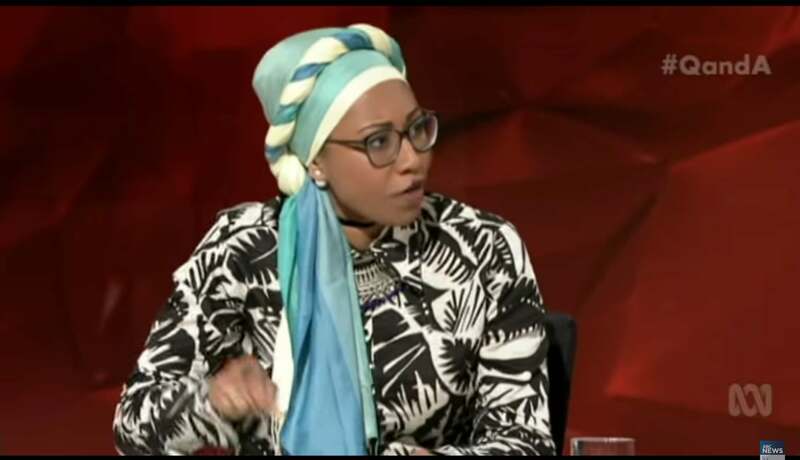 Yassmin Abdel-Magied had made herself a spokesperson for the ‘feminist’ nature of Islam and a public figure. What you see as ‘ad hominem’ I see as pointed criticism of the thought processes and the limitations of a public figure that a great many people take seriously for views in which she claims expertise. While there is an element of ad hominem in the article I don’t think it really makes the central argument fallacious. Perhaps that’s because I see the central premise not so much as a disagreement about the merits of sharia (it has none) but about the cognitive dissonance of a fawning left. The article sums itself up by explaining this very clearly… The left and Islamists both hate people like Majid and Ayyan for largely the same reasons. I fear for a Western society that can suborn universal human rights to the laudable goal of inclusive multiculturalism. The ideas of liberty and equality are non-negotiable. Those ideas are the first causes of liberal secularism. That the left can countenance any abrogation of those principles in order to appear tolerant of ethnic and ideological minorities is simply absurd. To be clear – if you cannot be authentically X, Y, or Z without also embracing liberty and equality for women, gays, minorities, etc. then YOU HAVE NO PLACE HERE. Not sure what you mean, are you saying that nobody should be allowed to live in the country unless they embrace these fine principals? In which case I disagree with you. Freedom encompasses everyone, not just those who embrace Liberty and Equality. The bigot, racist and the boofhead are part of us as well. That is why rational argument needs space to operate. Not suppression of it by some minority but by ensuring the majority are rationally discussed with and therefore, hopefully, are not TOTALLY driven by their emotions, as the left wing snowflakes would have us. The blindness of Fairfax/ABC to Islamism is only matched by the blindness of Murdoch etc to climate change. About time all parties opened their eyes to the bleeding obvious. The bigger question is, why are people with links to seditious/Islamist/jihadist/shari’aist groups like HUT brought on to television in order to “represent” moslems? Will they bring on members of the Westboro Baptists to represent Christians? Or is the scary elephant-in-the-room, the fact that HUT really do represent the MENA sunni community? Many leftists namely those on the anti racism and multiculti squadrons are dangerously hopeless. They are genuine hallucinated people even in the end they are just using their ridiculous analytical skills or lack of to conclude ridiculously this kind of thing. More than virtue signaling leftists are also intelligence signaling and they just repeat often with the same precise words what ((media))) says without any independent and neutral judgment because they believe they are being smarter, more rational than the avg joey, “based on facts”. What make leftists/gramscians stronger is not what is apparent, a bunch of morons in the wrong place deciding the destiny of millions but what is behind, who are behind them, the cerebral and hidden individuals who really have articulated but evil minds and not just a bunch of juvenile hippies. There is only one reality, very diverse, but still only one and this “woman” simply no have philosophical passion and skills to search,to follow or to find it. Based on absence of spontaneity in the political world and specially in this days I bet she’s not a random person. We really don’t know who she is to conclude anything by now, I think. If she is a real person talking what she really think and feel about your captive-vating religs so it’s just the manifestation of dark facet of feminine mindset, Stockholm syndrome. Maybe live in the world where you have all comfort (don’t need to work) specially if you are rich or belong to the high class and have luck in the marriage isn’t exactly a bad thing. Again the old debate: It’s the Islam that make some men misogynic or this is a excuse for their lack of character?? Islam may not cause misogyny per si but no doubt it or incentive to the directly bad behavior “woman is your playground” or incentive indirectly bad behavior via indifference “the neighbor woman was spanked but my religs say it’s acceptable if she deserves”. In modern west at least by now when a man spank a woman and it become public he wil be jailed while in the Islam as happened in the west in the near past this “domestic issues” are treated as “domestic” only the couple who can solve it or in other words only the man of the couple because woman is your property.